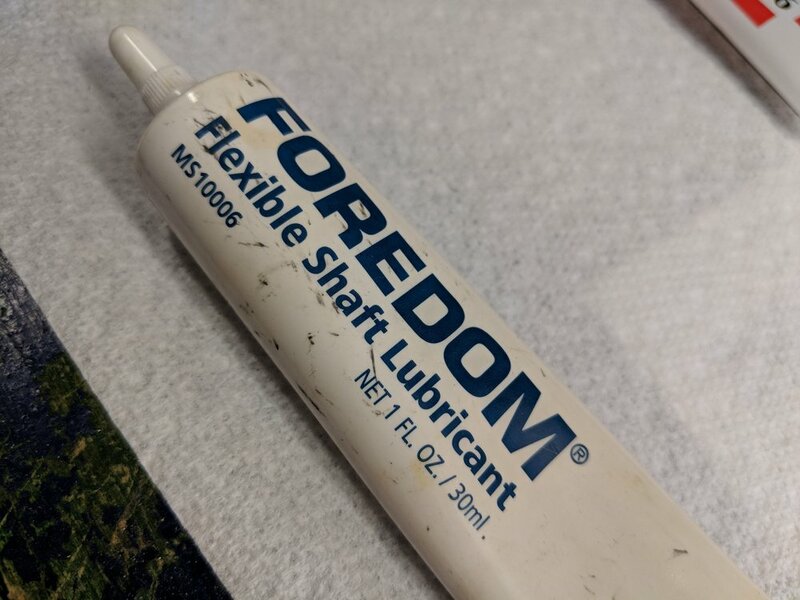 Did you save up all your nickels & dimes for a glorious rotary tool that is the Foredom Flexshaft? I know I did, & when you invest in such a beautiful tool, care must be taken to ensure it lives a long happy life. Not much needs to be done to keep a Foredom Flexshaft happy! But it does need some care every 50 hours or so. (there should be a small white tube of lubricant/grease that came with the flexshaft, if purchased new). Luckily, we had access to a workshop to do this! I found this helpful video on YouTube regarding how to go about this task. First, unplug from the power source. Make some room to lie the Flexshaft on its side, with newspaper or a towel underneath. Firmly yank on the hand piece to detach. Find a tiny flathead screwdriver. This will be used to loosen the screw just below the 'engine'. DO NOT take out the screw! Just loosen it a little to be able to slide the outer covering down towards the end, this will expose the inner coil. Apply a thin layer of lubricant across this coil - stop about 6-8 inches before the tip! Slowly slide the outer covering back on, make sure the end with the groove is at the bottom, there's usually a yellow "use eye protection" sticker at this end. You'll know something's up because the hand piece attaches to the groove of the covering. Before tightening the screw, measure the tip to make sure only 3/4" is exposed. Adjust the outer covering as needed. Do not attach the hand piece yet! Suspen the flexshaft vertically, place a bucket or garbage can underneath, & spin on high speed for approximately 15 minutes. This will make sure the grease is evenly distributed inside. I did about 7 minutes on the forward spin & 7 minutes in reverse spin. Attach the hand piece, & you're good to go for another 50 hours! Note: after 100 hours of use, the flexshaft should be thoroughly cleaned with acetone & re-lubricated. Hope this helps. Happy crafting!